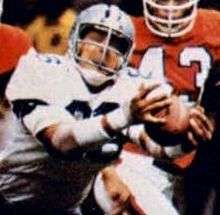 This is a complete list of American football players who have played for the Dallas Cowboys of the National Football League (NFL). It includes players that have played at least one game in the NFL regular season. The Dallas Cowboys franchise was founded in 1960 as an expansion team. The team has earned the most postseason appearances (28, which includes another league record of 54 postseason games, winning 32 of them), the most appearances in the NFC Championship Game (14), and the most Super Bowl appearances (8), two more than any other NFL team. The Cowboys have played for 10 NFL Championships and have won five, all five being Super Bowls.